In this charming and heartfelt sequel to the New York Times bestseller To All the Boys I've Loved Before, we see first love through the eyes of the unforgettable Lara Jean. Love is never easy, but maybe that’s part of what makes it so amazing. 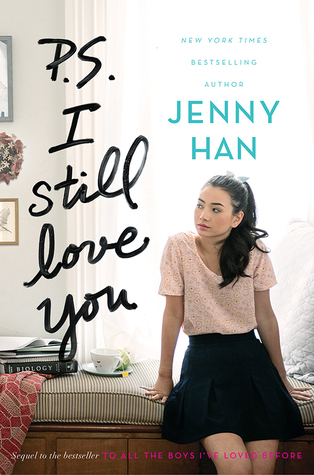 The Review: PS I Still Love You is the second book in Jenny Han’s To All the Boys I’ve Loved Before series and if you honestly haven’t read this series then I highly recommend adding it to your to-be-read pile because it’s amazing! This is the second time I’ve read PS I Still Love You and it was just as good as the first time. With the release of the third book I wanted to refresh myself with the series and I’m really glad I did because there was so much information that I completely forgot. Not only that but it was great to familiarise myself with these fantastic characters once again. After the events in To All Boys I’ve Loved Before you go into the book with hopes that Lara Jean and Peter are together and happy and while that might be true, there is one certain girl that is willing to disrupt the happiness that the loveable couple have found together. So while I was expecting some fluffy romance, I got a heart-breaking story that really pulled on my emotions and it was still fantastic to read because Han has a way of pulling you into the characters story and not letting you leave until you’ve finished it. Now I knew from the synopsis that another one of Lara Jean’s boys would also play a role in this story and that was John Ambrose Maclaren. While Lara Jean and Peter are going through their relationship problems, John was really there for her. John is a great character. One that anyone could easily fall for. However my problem was he just wasn’t Peter. If John had come first then maybe things could have been different but for me, I am firmly and will always be a Peter fan. I really did enjoy this book. It has a good mixture of happy, sad, funny and emotional times and the story develops enough for you to want to read more. I can’t wait to dive into the third and final book! And we’re back with another post today featuring our favourite UK candle and craft company Bookworm Candles and Crafts. Today’s post is really going to highlight some of their latest products that are available to sell and if you’ve been keeping an eye on their Instagram, Twitter or Facebook feeds you will already know there has been a lot of new goodness from Danielle the person and brains behind this company. So I’m going to start with a new range that has come to Bookworm Candles and Crafts store which is The Feels Candle Range. I bet you’re wondering what The Feels mean? But you all know them stories that give you major feels? Well take a look at some of those feels in candle form! This candle has been available in the store for some time however it’s back with a new look and a slightly new scent which smells like Stars, Surprises and Hope and representing that moment in the book where one night a year when the stars literally fall from the sky in the Night Court. This is one of the first new adult romance inspired candles featured in the store. No collection would be complete without a Colleen Hoover inspired candle. Smelling like Cedarwood, Honesty and Heartbreaking Memories and has a woody clean fresh scent. This candle is inspired by the moment where Ridge explains how he came up with the name of his band, it really gives you the feels. This candle is inspired from Snape talking to Dumbledore and uttering those words ‘Always’ while producing his doe patronus really gave us the feels. Smelling like Devotion, Longing and Lilies, this candle has a true floral scent with notes of star gazer lilies. It’s a perfect addition to any Harry Potter fans collection. This candle represents everything between Jem and Will’s parabati bond and let’s not forget that famous quote ‘Entreat Me Not to Leave Thee’ between the pair. Smelling like Bonds, Vows, Friendships, and this candle has a gentle musk scent with notes of violet lily and rose and comes in a lovely bright red colour. This beautiful candle is inspired by the carranam bond formed between Aelin & Rowan through-out the last few books. Their bond is like no other and the candle represents it’s strength. Smelling like Claiming, Fae Powers and Bonds this candle has a light citrus magical scent with notes of neroli blossom and basil. Perfect for any of fan of this one moment that will definitely give you the feels. This candle is inspired by the event Calanmai in the book and a lot of you will relate it to Tamlin and Feyre but Danielle (the maker) made this candle because it reminded her of the moment Feyre & Rhys first met and he says those first words to her ‘There you are. I’ve been looking for you.’ Smelling like floral decadent fragrance with notes of violet, sweet musk and crisp apple. This candle is perfect for you fans of the book and either which team your on. Everyone loves Twilight so why not have a Twilight inspired candle featuring one of our favourite parts of the book. This candle smells like bonds, ties and gravity and has a mystical scent with notes of plums, rose, myrrh and sandalwood. This exotic fragrance is perfect for any fan! All of these candles available in three different sizes starting from a sample 20z size, 6oz tin and 10.5oz jar and prices start from as little as £3 and all of them come with their own crochet band and charms are added to the jars to give it that extra sparkle. So what do you guys think? They look amazing don’t they? These are the first six candles from the Feels Range and you’ll be sure to bet there will be more along soon! Now as is tradition we are offering a small giveaway to you lovely readers/followers/supporters. ONE winner a choice of TWO 2oz sample candles from the range – so you can choose between Starfall, Sounds of Cedar, Always, Parabati, Carranam, Calanmai or Imprinting. So good luck everyone and watch this space because another post is coming soon! Hunter Garrity just wants to be left alone. He's learned the hard way that his unusual abilities come at a price. And he can't seem to afford any allies. He's up to his neck in hostiles. His grandfather, spoiling for a fight. The Merrick brothers, who think he ratted them out. Calla, the scheming psycho who wants to use him as bait. Then there's Kate Sullivan, the new girl at school. She's not hostile. She's bold. Funny. Hot. But she's got an agenda, too. With supposedly secret powers rippling to the surface everywhere around him, Hunter knows something ugly is about to go down. But finding out what means he'll have to find someone he can trust. . . 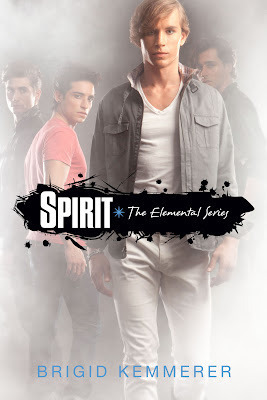 The Review: Spirit is book three in the Elemental series and unlike the rest of the series, this book isn’t about a Merrick brother but instead their friend/enemy Hunter Garrick. Hunter like the Merrick brothers has an affinity that he can control to his will, however he is the one of the rarest – the fifth element Spirit, and while I was definitely interested in learning more about the Spirit element, I have to say I wasn’t all that excited to get Hunter’s book so soon – especially seems I was more interested in reading about the brothers. And if I’m honest I wasn’t over keen on Hunter because of his actions from the first two books. However, once I started this book I have to admit it was pretty hard to put down and I quickly started to like Hunter more as a character than I actually thought I would. Hunter is a hard character to like because you just never know where his actions are going to take him and also if you’re on Team Merrick then it’s hard to like Hunter because he’s pretty untrustworthy sometimes. His actions make him so and I was pleased he kind of redeems himself through-out the book. He actually has a really hard time throughout Spirit and I did really feel for him. He’s hurting and has no-one to turn to – not even Gabriel and I missed the friendship he had with him – even though they don’t admit it, they are friends and seeing them at war with each other only added to Hunter’s problems. He finds trust a big issue and while you can see that the Merrick brothers want to help him, Hunter does not and just finds more reasons to be at war with them. Being Kate into the story was interesting and very unpredictable – that ending? Seriously? I loved and hated it. I wanted more for Hunter. He was already struggling with so much and then *SPOILER* they don’t even get a happy ending. I was heartbroken. I’m not a fan of those type of endings and even now I don’t see why it needed to happen, but overall the whole story really had me hooked so I still enjoyed it. In all Spirit took me by surprise and in the end even though some events didn’t happen the way I would of liked, I still enjoyed the story and it was a good addition to the series.